If you work as a taxi driver you must have a plan B, because someone out there will change the game. Thousands of taxi drivers will be replaced by robots. The driverless cars is one of the biggest and fast growing technology trends at the moment. Goolge have been working on a driverless car for some years now, and many others are working with the same case. Google said they will be ready for the mainstream market in about five to ten years, but driverless cars is in use already today! The UK government is pouring about $30 million into those driverless cars, and Britain have real driverless cars on real roads in four different places in the country today, right now. “An essential part will be an effective and fast communication between cars, and between cars and existing and future roadside infrastructure,” said Dr Evtim Peytchev, of Nottingham Trent University. Business Secretary Vince Cable, backing driverless car trials in four cities, believes driverless transport could become a £900 billion industry worldwide by 2025. Google is not alone on the market for this new technology trend. Audi`s next generation A7 is on the road today, and Mercedes, BMW, Volvo and Toyota are working to make a big advantage in the new auto market. But what`s funny is that some of the innovative companies in this new market isn`t real car company`s. One of them is Google, but Apple is also on this trend now. 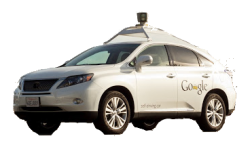 Google`s driverless cars have traveled thousands of miles and most importantly; without an accident! Awesome. One of the biggest privately held technology company`s is Uber, which I have talked much about in my recent articles. Google venture is not only investing in real hi-tech company`s, and it is no secret that Google have invested huge amount of money in Uber. A company that is taking the world by storm right now. Uber have so far made many taxi drivers angry, and Uber have disrupted the old traditional taxicab market already. This is just the beginning. Uber and Google will shock the market again, but this time it will be critical for the taxi drivers. Reason: driverless cars + Uber. What a mix. But there is a drawback; Uber and Google may have a conflict of interests, because Google is so far along on the ride-sharing portion of this combination. Your cab in the future will be a smart phone on four wheels. Taxidrivers have been angry about Ubers innovative business model, but what are they gonna do when the driverless cabs comes to the market? They will be fired. You think that a human/taxi driver is better and safer than a computer but it isn`t. A «driver» is safer on the road than a human/taxi driver. The driverless cars will make peoples`s life easier and cheaper. CEO`s and other workers can use the new car/cab as an office instead of driving the car. Some companies will organize driverless carpools for their employees if they work overtime. Parents can send their kids to the school and other activities without a driver/busy parent. They say it is safe, but is it 100% safe? What if the driverless car crash. Who are responsible? Who can you blame on? According to The New York Times, policy makers and regulators have argued that new laws will be required if driverless vehicles are to become a reality because “the technology is now advancing so quickly that it is in danger of outstripping existing law, some of which dates back to the era of horse-drawn carriages”. Wouldn’t this create massive unemployment? And less revenue to the govenment by way of taxes? Sounds like something legislators would never allow. Governments around the world don`t know what`s going on now. Robots will take many of the workers job in the future. It`s not only taxi drivers. What about the transport industry? A big challenge for the governments.